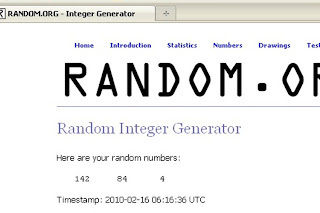 Since my little bird is sick and in bed early, I decided to use the Random Number Generator to pick the winners instead. So here are the numbers that were picked and the 3 winners of my felted soap..... Amanda, Geni and Jona! I've sent emails to the winners so hopefully I can send their prizes soon! Now do you remember my funny lady transfer drawing? I did a special drawing for her and she is going to live with Lola now! Hope she brings you some smiles Lola. Thank you all for visiting my little blog and I hope you'll come back by to visit again sometime. I've thoroughly enjoyed this experience and hope to get to every blog on the list, some day! And a HUGE thanx to Lisa for creating this spectacular event! Can you even imagine how many blogs might participate next year?! As my birthday has recently passed, I've found myself reflecting on my year of art making. I'm surprised at how little art I've created, to my liking anyway! 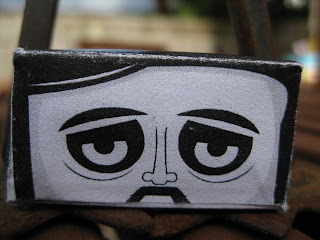 My job keeps me busy, busy and it is a very loosely structured work schedule, so it is hard to designate creative time. And when I do have extra time, I want to spend it with my family, not to mention there is house cleaning, Ugh! My only saving grace is I was sweetly reminded that although I don't have much time for my own creations, through MECCA, I create a space for and encourage the creativity in countless others. In this way, my creative efforts are actually multiplied 100 fold or more. This thought helps to soothe my soul. Since I've been reviewing my creative year, I thought I'd share some of my pieces with you. I'll do this over a couple posts as there are several pics. First I'll share some paintings I made for a Paintings and Poetry book project with several artists I truly admire. Below are most of my pages. I chose the poetry of Anne Morrow Lindbergh as my inspiration. While I was pregnant with Raven I found her book The Unicorn and other poetry and would read it out loud to my big baby belly while rocking in the rocking chair. Her words often inspired vast visions in my mind and brought about physical reactions from my body. She was the obvious choice for me. 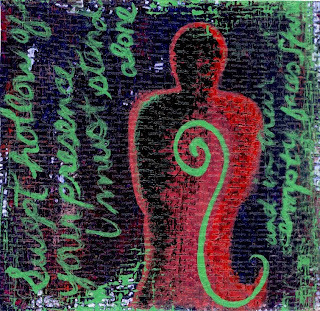 The paintings are 6" x 6", if I remember correctly, and I used textured vinyl wallpaper samples as my canvases. This painting is called The Anemone Garden and the line "her swaying garden of anemones" is painted on the right side. 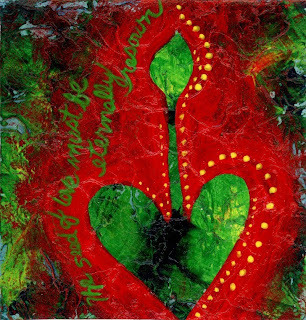 This one is called Seed of Love and the line "the seed of love must be eternally resown" is painted on the left side. 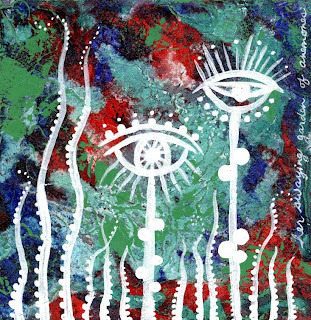 This painting is called Captive Spirit and the line "captive spirit running free" is painted on the right side, in light blue. 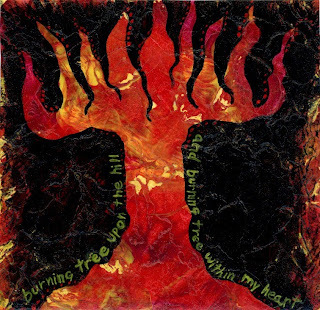 This one is called Burning Tree and the line "burning tree upon the hill and burning tree within my heart" is painted in yellow along the tree trunk. 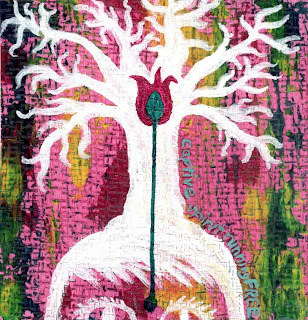 Stand Alone is the title of this painting and the line "Swept hollow of your presence, I must stand alone and in their empty faces stare" are the painted words. 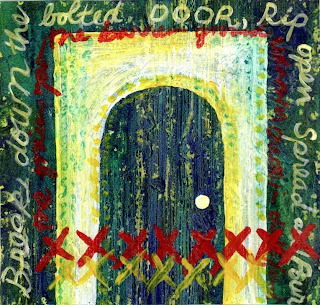 This painting is titled Bolted Door and the line "Break down the bolted door, rip open, spread and pour" are painted around the door. 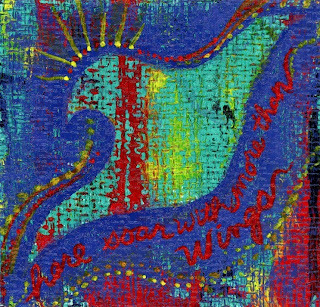 This piece is called More than Wings and the line "here soar with more than wings" is painted below the flying image. And lastly, this painting is called Leaves of Youth. It is apropos as I find myself struggling to admit I am "middle aged" and fully exposed on top of the mountain of my life, looking down to the other side. Yes, it still looks a long way down but everyone knows that traveling down hill happens twice as fast, if not faster. 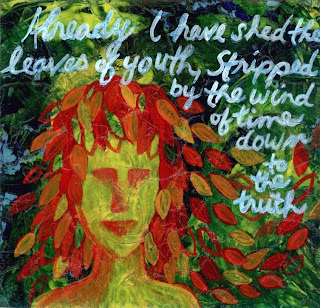 Anne's words "Already I have shed the leaves of youth, stripped by the winds of time down to the truth" make me hopeful. That I may appreciate the experiences of my younger years, how they've protected and shaped me, but that as they fall away my true self will become more fully exposed, in all it's strength and glory. I will be sharing some other art I've created over the last year in near future posts. So stay tuned. Come Take a Magic Carpet Ride! Feb 6 Update: The One World One Heart blog event now has over 1,000 participants! I am thrilled with the great response to my own blog and wish I could send a giftie to everyone who has commented. Thanks to all who have stopped by and if I reach over 250 comments, I will add 2 more prizes! Smiles. I'm so excited to be joining in the One World One Heart blogland giveaway this year! This is such a fantastic idea that Lisa Swifka came up with a few years ago. And it's grown and grown every year since. If you're interested in finding out more or joining in the event click the link above. Anyone can join in before Feb. 8. and there are links to over 500 participating blogs on Lisa's website. This event is a wonderful way to connect online via individual blogs. From painters to writers to photographers to jewelry artists to chefs to knitters, so many people share their passions, skills, adventures, triumphs and challenges on their blogs. Some baring their souls while others just give a taste. I find it fascinating! Aren't these colors luscious? 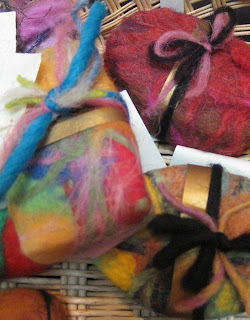 I'll be gifting TWO people with fuzzy felted soap! 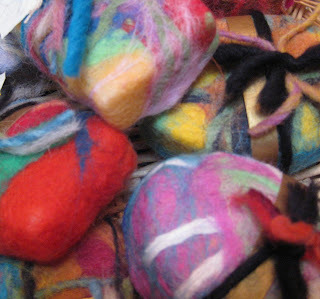 Yes, it's really felted soap and if you've never used felted soap before, you're in for a treat. To use this soap, all you do is submerge the whole thing in water, felt and all, then put it to your body and start scrubbing. The wool is naturally anti-bacterial and acts as a feel-good exfoliant. 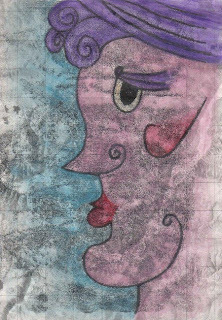 She is a 6"x9" oil transfer drawing over a topographical map that I then drew and painted with watercolor pencils. She has some unique features that endear her to me. I hope she makes you giggle too. So, do you want to win one of my 3 prizes? Yay! Now here's how it works, you must leave a comment, only ONE comment, with this blog post. (Duplicate comments and spammers will be deleted) Make sure you include a way for me to contact you if you're a winner. I will pick the winners at about 6pm United States Pacific Standard Time on Feb. 15. My daughter, Raven, will pick the winner from a hat (likely a witches hat altho she's been sporting a cute black bowler lately). Anyway, thanx for stopping by and playing... I hope you win!!! Yes I have been neglecting my blog. Tsk Tsk! Quite honestly, I knew I would. It is just the kinda girl I am. When a project appears daunting to me, I start to procrastinate. Then I find just about anything to do other than that. The funny thing is, most of the time, whatever it is I'm avoiding usually isn't that big of a deal once I do it. Then I wonder what my problem was the whole time. I know, I'm silly. It's no secret! 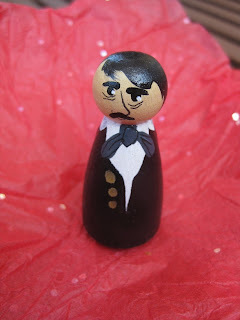 So it is now February and my Poe gift exchange ended in Oct but I cannot blog another thing until I finish showing you all the amazing creations I was blessed with! My last post was about my gifties which were opened on day 6. Well on day 7 we opened the present from Michelle Remy. When I was a kid, I loved miniature things! Anything that was a small representation of something large, and that I could fit in my pocket, was intriguing to me... so Michelle's little E.A. Poe made my inner child squeal with delight! Isn't he darling! He's so small he lives on my flat screen computer monitor now. Thanx so very much Michelle! 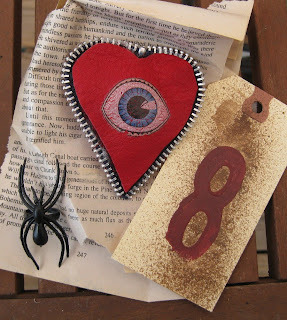 She made a leather heart pin with a metal zipper edge and a big EYE in the middle! I dig this, it is so clever and just plain fun! Thanx Dawn!! On Day 9 we opened gifts from jubilant Julie Molina. 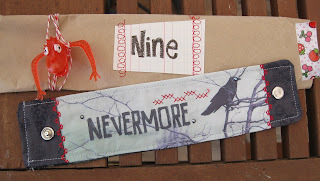 And what a treat it was, a super groovy cuff bracelet that tells me Nevermore! Thank you Julie, it so freakin' fantastic! On Day 10, we opened gifts from the palpitating Pilar Pollock. 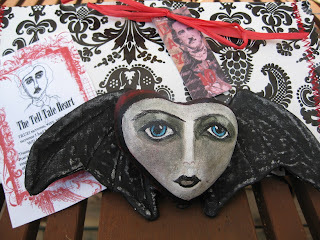 Look at this marvelous creation... A painted canvas heart with beautious bat wings. Thank you, thank you Pip! She's a beauty. A wonderful little hanging canvas with the words and images meandering from the front to the back or vice versa. I just love the peaking eye too. Thank you Catherine! Day 12, oh what a day... I got to open this itty bitty teeny weeny box from Liz Gale. It had been staring at me for days so I was relieved to finally open it and see what tiny treasure lay inside. A magnificent miniature book of the poem the Raven! (photo courtesy of Kelly Snellling). WoW! I was shocked and amazed and thrilled with this little book. Thank you Liz! 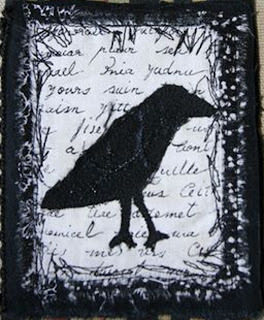 A fabulously functional gift with Poe written all over it... a pins and needles case! That Martha is such a clever girl. I had to hide this from my child, Raven... I could see the coveting look in her eye after I opened it. Thanx Martha! Well this Poe gift exchange is well over and done but I surely hope we have another next year 'cuz it was sooooooo fun!! 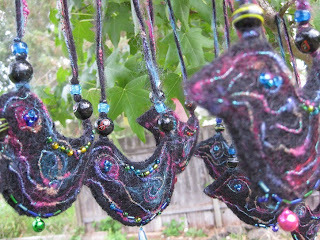 Many thanx to all the lovely artists who participated in the fantastic swap and to Michelle Remy for hosting it. Yay! Thanx for sharing in my joy and treasures. See you next blog post! 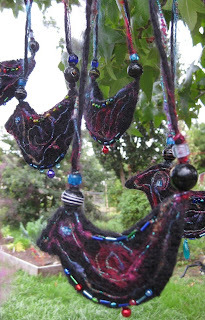 Felted Raven Adornments with shiney threads and bright beads, such things a Raven would covet. 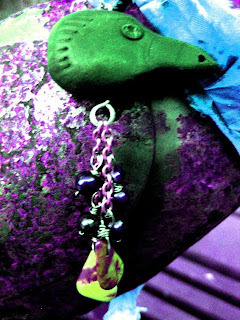 And this bird is more than just a necklace.... it is also a pouch... a little place to hide your shiney, rusty or natural treasures found as you fly through your day. 'Tis the wind and nothing more! 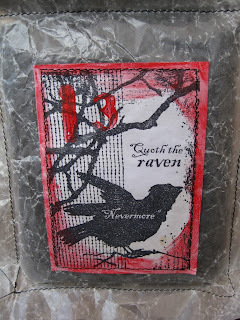 'Then the bird said, `Nevermore. Quaff, oh quaff this kind nepenthe, and forget this lost Lenore! Is there - is there balm in Gilead? - tell me - tell me, I implore! Clasp a rare and radiant maiden, whom the angels named Lenore? 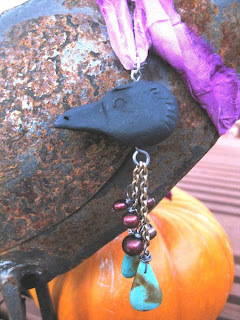 "Once upon a midnight dreary" dear Tami Roth gave to me, a kreepy kool Raven/Edgar necklace! And beautiously wrapped in a star shaped box with scrumptious ribbons! Thank You, Thank You Tami! My daughter Raven has already tried to claim it as her own.... but I'm not relenting. 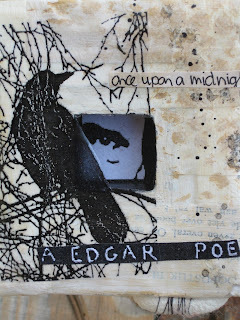 ...a lovely collage with an excerpt from the sorrowful poem of Edgar's called Annabel Lee. Many thanx Linda! and inside I found this precious, hand-made heart pendant! Thank you Saundra! .... And now at the dead hour of the night, amid the dreadful silence of that old house, so strange a noise as this excited me to uncontrollable terror. Yet, for some minutes longer I refrained and stood still. But the beating grew louder, louder! 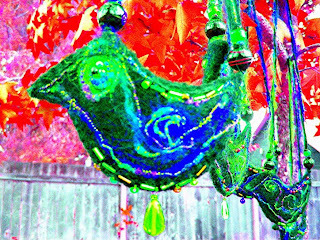 I thought the heart must burst.... Excerpt from The Tell-Tale Heart. 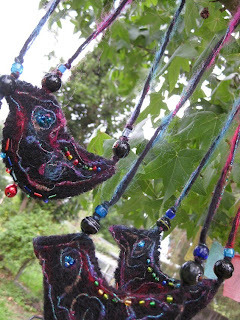 wrapped in this splendid fabric bag of spooky imagery and yummy colors, this fantastic necklace with a shrine pendant full of detail and delicious color! With the last line from The Tell-Tale Heart and Edgar on the back, close to my heart. Wow Terry, Thank You! a treat and a treasure and a hand-wrought Raven of my very own! 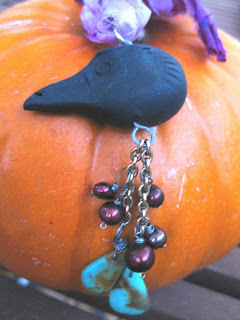 Shiny pearls and powerful turquoise dangles from the Raven. She's carrying them off to her nest of treasures now doubt. Thank You sweet friend! Kelly well knows my affinity for Raven's. She and I both have a love of birds but Raven's have a mystical and sometimes macabre character that makes them even more interesting. 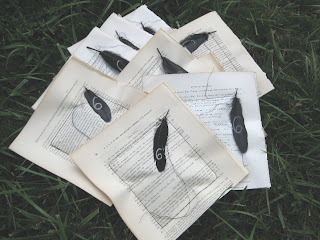 Raven's are known in legends and tales as intuitives, tricksters, messengers, communicators and keepers of deep mysteries, holders of ancestral memories, and are thought to be representative of our shadow selves or the darker side of our psyche. 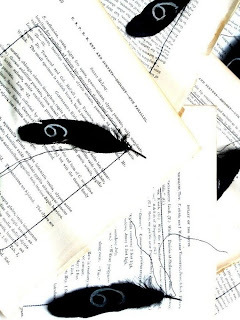 The negative connotation of the Raven has mostly surfaced within the last few hundred years. This may be related to their scavenging the remains of battlefields and so they became an omen of death. I prefer to revere them for their primordial, resourceful and comical qualities. Really, just watch a Raven strut and hop about, it's sure to make you giggle. I do remember the first time I read Edgar Allan Poe's poem The Raven, in 6th grade I think. Quite the conjurer of fear and madness is he. I remember I read it 3 or 4 times in a row. 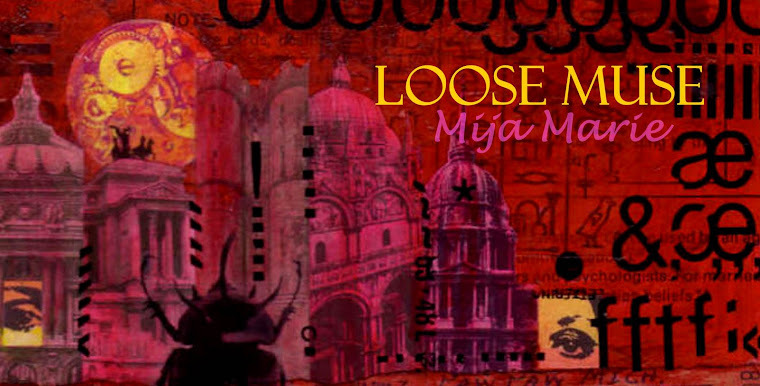 It chilled me and the images my mind created have stuck with me all these years. Then I read The Tell-Tale Heart and The Pit and the Pendulum, once again I quaked and shaked but still I wanted more. 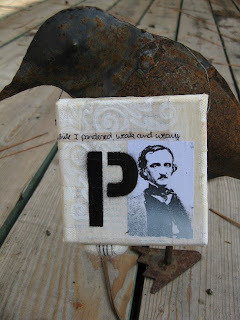 Poe believed that "Words have no power to impress the mind without the exquisite horror of their reality." Oh, he got that right!